...how about gusts to 50? 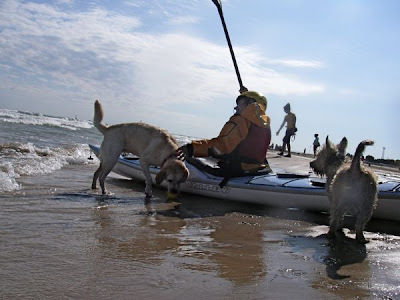 We love playing in the waves and practicing rescues, but last Friday we decided to simply paddle. 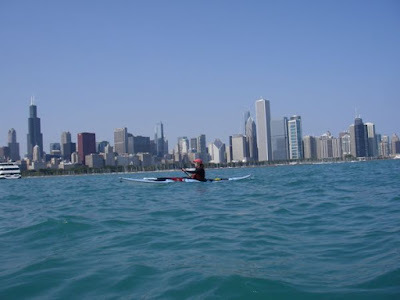 In fact, we decided to paddle from Evanston to Indiana and just glide by Chicago's entire shoreline. Hello, Chicago. Sharon paddles by without stopping. We put in at Juneway Terrace Beach (technically a block south of Evanston) around 10 a.m. and headed south. We passed the familiar beaches of Chicago's north side--Leone, Wilson, North Avenue--and the still-quiet harbors--Montrose, Belmont, Diversey. By noon, we were around Navy Pier, and boat traffic was picking up. We exchanged greetings with visitors on the tour boats and paddled on. Still life with Alec and tour boats. As we got to Hyde Park, the wind and waves were picking up. 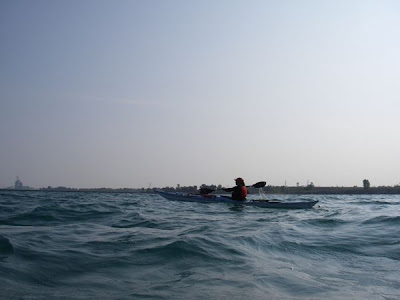 We continued on, past Rainbow Beach, past the water filtration plant, to the Calumet channel. The smokestacks of Indiana are closer and more beautiful than ever....or something like that. That's when we realized we didn't have time for the final two miles. We had arranged to meet our kids back at 63rd Street at 5:30. So we turned around and paddled those last couple of miles in the wrong direction (from a making-it-to-Indiana perspective) but the right direction (from a meeting-our-kids perspective). Arriving in the 63rd Street harbor. We learn something every time we get on the water. 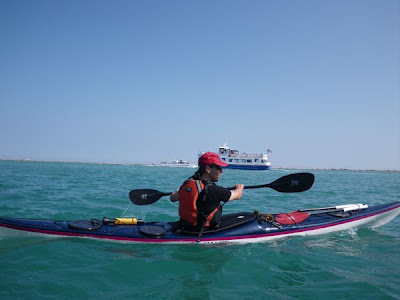 This time, we learned that some of our clothing causes chafing, that it's easy to forget to take enough photos, and that it's fun, once in a while, to paddle past Chicago without setting foot on shore. Of all the regular denizens of our day hatches, one has a special place on our gear list: the cag. The cags we carry are lightweight, hooded garments with a bungee hem that can sretch to fit over a cockpit coaming. 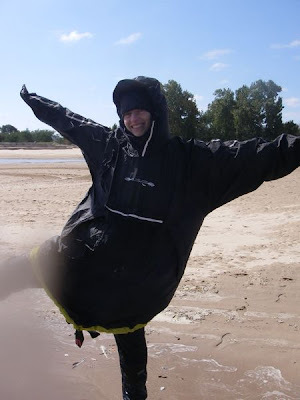 We've only used them once on the water when a student seemed to be getting hypothermic, but we frequently pull them out on land and often put them on people who are getting cold and miserable. They fit everybody and have room for everything they might be wearing, including a PFD. The effect is immediate, thanks to the combination of windbreaking and solar heating (particularly with our black one). We could go on and on about how much we love our cags, but we don't want to be anoraks. 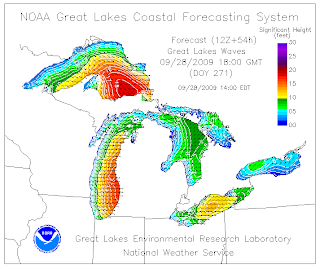 Mariners and coastal dwellers consider nor'easters trouble. 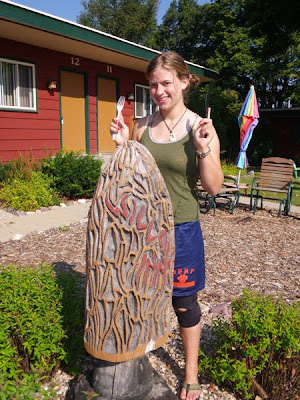 Paddlers on the southwest shore of Lake Michigan consider them a gift. The forecast for today was NE winds 15 to 25 miles per hour and waves 4 to 6 feet building to 5 to 7. That's the kind of geeky weather detail that lights up the message boards and clogs up bandwith on Chicago paddlers' iPhones. So yeah, we went down to the doggie beach/water trail launch site at Montrose. The waves were big, frequent and chaotic. But the water was still warm and friendly, so in addition to playing in the waves, we took the opportunity to practice swimming our boats in to shore. We knew (or believed) a few things going into this: That boats travel more slowly upside-down than right-side-up, that you always stay upwave of your boat, that it's best to hold the end toggle and avoid putting a finger inside the loop, that anything loose would soon be gone, that breaking waves would cause the boat to lurch. 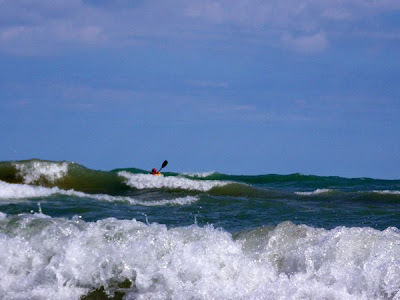 - Even though Alec was prepared for the boat to lurch in larger breaking waves, one wave managed to tug it out of his grip. It tumbled upright and waited for him and he was able to catch up with it. - Sharon found it best to swim off to the side behind the boat so that she wasn't hit in the face or thrown on top of it by a breaking wave. - Alec found that holding the paddle was easier if he kept it below the surface of the water. Both of us were surprised by our lack of desire to come out of our boats in breaking waves. It seemed to go against everything we've worked on--the ability to stay in our boats and in control, particularly in challenging conditions. But that's exactly why we did it, so that if it happens in the future unintentionally, we'll have some experience to fall back on. This past weekend we headed up to Devils Lake, Wisconsin. We didn't bring boats. We didn't bring bikes. We didn't even bring camping gear. But we did bring family: the four of us, plus Alec's parents and his brother and sister-in-law. Devil's Doorway. Alec's brother and sister-in-law are in the foreground. 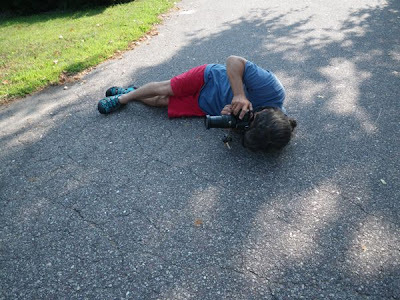 An opportunity to take photos with a non-waterproof camera. We stayed in the lovely Willowood Inn, hiked in the park, played lawn games (bocce, horseshoes, baggo, ladderball), and indulged our love of exploration. Hannah samples the local flora: a morel mushroom, sort of. 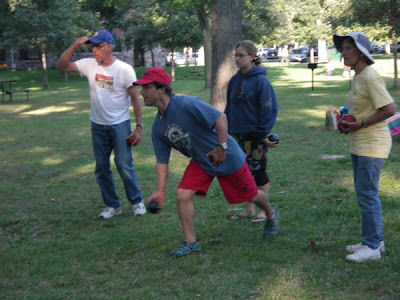 Alec and Hannah playing bocce with Alec's mother and father. Travel has always been a way for us to reconnect. We go somewhere with a plan; some of it works and some of it doesn't. Everybody has to be flexible and figure things out together. And in the process, we discover things about the place we're visiting and about ourselves. 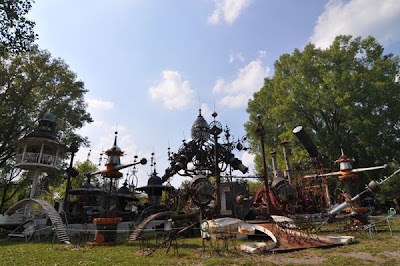 On the way home, we stopped at Dr. Evermor's Art Park. 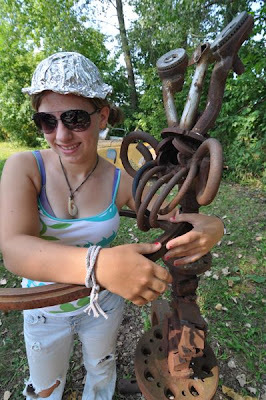 Hannah cuddles up to a scrap metal creature. 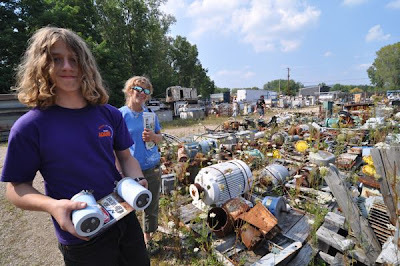 We all prowled the scrap yard next door. 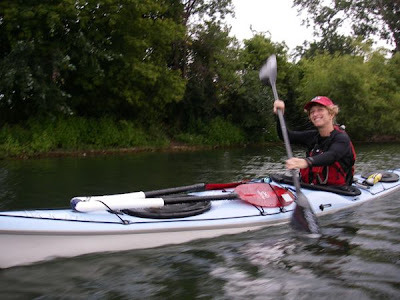 We've included this post even though it isn't about paddling because travel, exploration and self-discovery are ( as it says in our blog tagline) "related passions."